I was pleased to hear recently that as a result of an article last January, Gina Switzer received orders from around the country for just over 30 paschal candles. 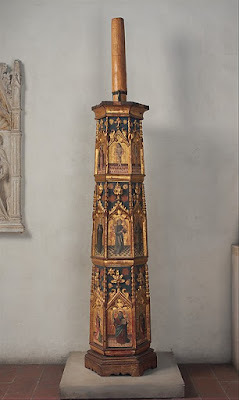 When she was telling me about this, she also mentioned that she had seen pictures of medieval paschal candle holders, and it had occurred to her that this would be a good option for parishes as well. At the risk of reducing Gina’s commissions, I thought I would pass this idea on to you. This would be something that parishes might consider commissioning from an artist. It would require a carpenter to create the wooden frame into which a series of panel paintings in egg tempera could be laid. Once installed, it would allow for a greatly reduced candle budget, at least, since the candle that goes in it is relatively small and plain. The only example I could find was this one which is at the Cloisters Museum in New York City, from the 14th century. I would love to know if readers can provide us with any other examples - perhaps even some contemporary examples - that might inspire further 21st century artistic activity in service of the Church!